A NEW ZEALAND RESTAURANT IN WESTLAKE VILLAGE – WITH GUESS WHAT KIND OF WINE LIST! Dorianne, Richard Clark and I went to the new restaurant in Westlake Village tonight, sort of by accident. Our house is for sale and they wanted to show it at dinner time, so . . . I suggested Ahroha, the new New Zealand Restaurant that we had seen the night before. It’s been open for nine weeks. Chef Gwithyen Thomas and his wife opened this place on their own after Gwithyen had worked as a chef in eight previous restaurants over eleven years. He looks like he is about 28. The restaurant is in a small space that had been empty for some time. We had an amazing meal – venison, lamb, scallops, etc. Entrees run in the $30’s, but are well worth it – excellent ingredients, many sourced from New Zealand, beautifully prepared and served very competently. The wine list is very heavily New Zealand oriented, which is both what you might expect and very nice. 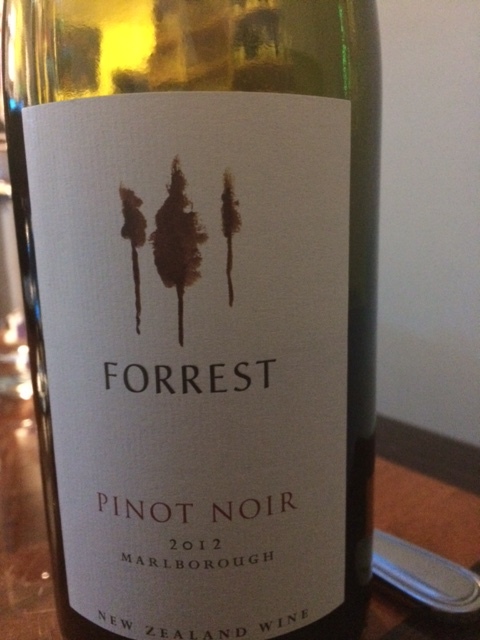 We chose a mid-range 2012 Pinot Noir from Forest. Very nice, evenly balanced, peppery. It struggled to keep up with the heavy meats, but it did fairly well. We ordered the wine before deciding on entrees, or we might have ordered something more substantial. I noted that on the wine list, wine by the glass was a bit expensive and the bottles were something of a bargain. The bottle price was just about the cost of three glasses. I look forward to returning and exploring more of the New Zealand wines – there are also a smattering of California, French, and Italian bottles, by the way. There is also a nice brunch menu. We now have a New Zealand restaurant and a Kurdish restaurant (Niroj Levant) within a mile or so of each other. Very nice!